Have you dreamed of your own private cottage at the beach? 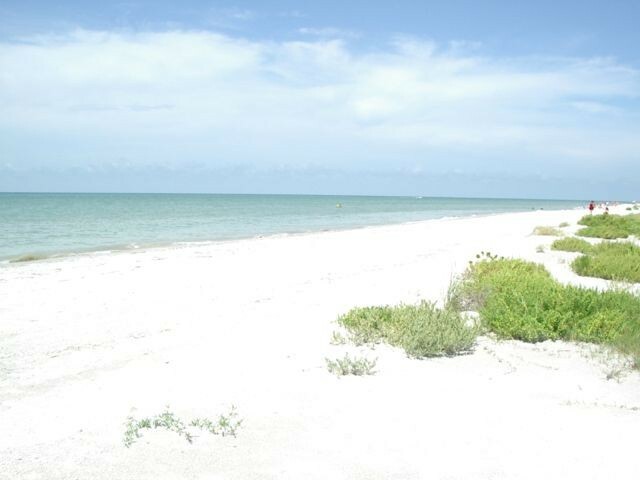 Let us help you make it a reality with this Sanibel Island rental. Duggers #4 is one of 7 quaint cottages at Duggers Tropical Village that harken back to Sanibel when there was a ferry to the island and condominiums didn't exist. 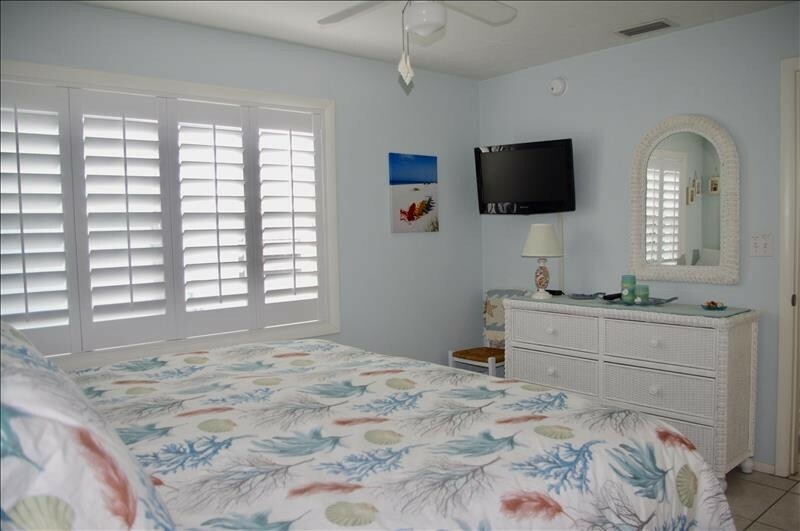 These cottages are directly across the street from the beach, via private deeded access, and are only 1.3 miles biking or walking distance to the heart of the island galleries, restaurants, shops, grocery and theaters. 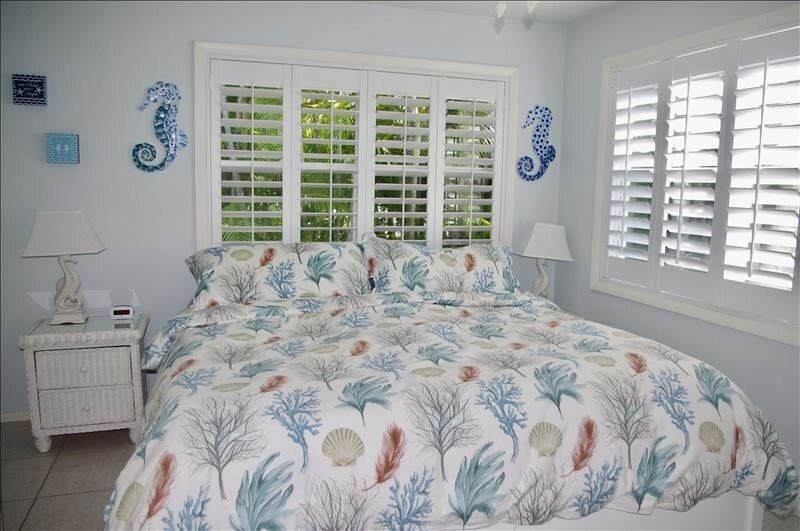 Duggers #4 is painted a pale blue throughout, and features plantation shutters, ceramic tile throughout, central heat and air conditioning, and has everything you need for a stay of one week, one month or longer. The kitchen was updated in November 2018, and it has quartz countertops, a stove, oven, refrigerator and a microwave. In addition, there is a quartz-topped peninsula that seats 4, separating the kitchen from the living area. The living room has a sectional sofa, wall-mounted flat panel tv, a dvd and cd player, a lovely glider/swivel club chair and a storage bench that is perfect for tucking away your backpack, dog toys or more. The bedroom has a platform King bed with storage drawers, a flat panel tv, and a full bath with a walk-in shower. 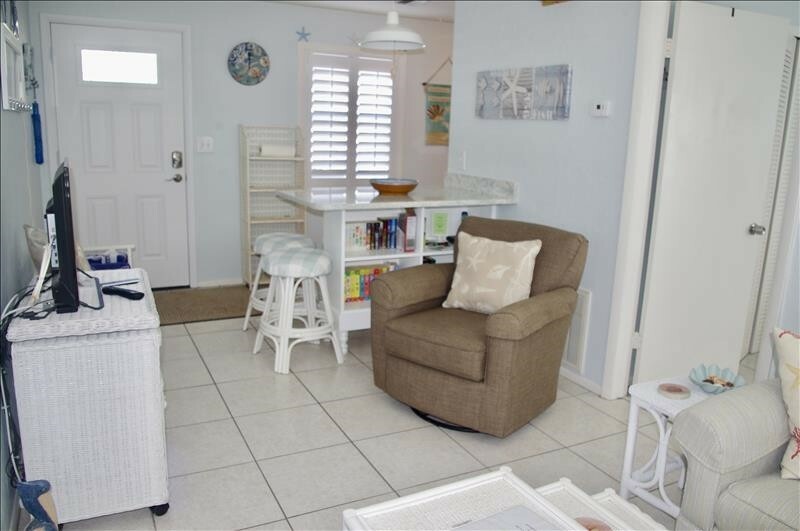 In addition, there is a lovely outside patio with a charcoal bbq grill, an outdoor shower, beach chair storage and a hand beach cart to make the trip via the deeded beach access quick and easy. A little laundry house is located on site with a coin-operated washer and dryer for your use. The beach is 150 yards away via private beach access adjacent to White Caps cottages. 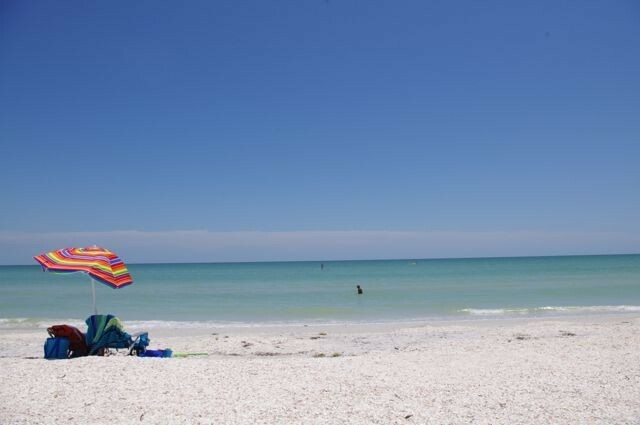 Fabulous Sanibel shelling is right there! Island restaurants, galleries and shops are 1.3 miles away. A minimum one week stay is required at Duggers Tropical Village. 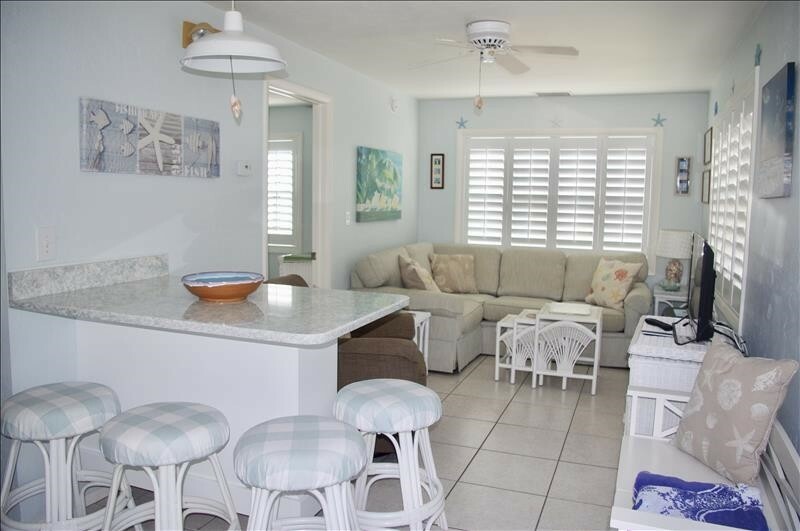 Duggers #4 is professionally managed by Cottages to Castles of Sanibel & Captiva. Since 1997, they've been making sure that each stay is a memorable one. Your dog (50lb maximum) is welcome at this property with prior approval of the Owner and Cottages to Castles. Payment of a non-refundable pet fee is required. The non-refundable fee is based on the length of your stay and the number of doggies in residence and/or visiting the property. Weight limit and breed restrictions may be applicable, based on the size and type of property rented. Please contact me with information regarding Duggers Cottage 4. Can’t wait to go back next year. Everything I needed was supplied. We spent a week here for our twentieth anniversary. This little cottage was just perfect for two people. The walk to the beach is easy and the shelling is good in both directions. We really enjoyed our stay in this sweet little spot. Cozy cottage – just right !! Had a great time and the cottage was clean and well equipped. Wish there was one of those collapsable wagons to haul stuff to the beach though. Maybe rent them out? 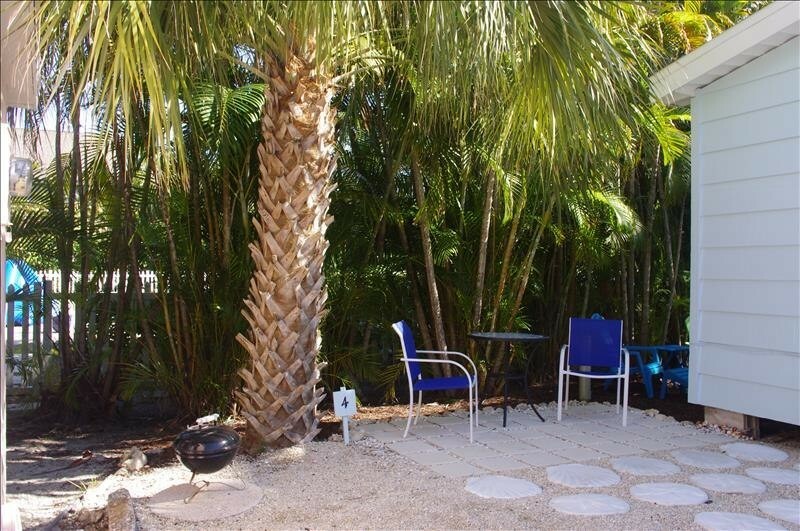 The property is perfect for a couple and well maintained. We appreciated the cottage being so well stocked with necessary household items. Would love to return. Great week weather wise but no pool was a disadvantage with Red Tide keeping us out of the water. The place was so awesome, it was the cleanest place we have stayed. Would rebook anytime. It was the perfect size cottage for the 2 of us, very short walk to a great beach, and the walk was a lot of fun – saw something new every time. Much better staying here than at a condo – it gave the old feel of Sanibel to us. It reminded me of the 1970s when I would come down with my family back then. After staying at condo properties during previous visits, the thought of staying in a bungalow was very appealing. 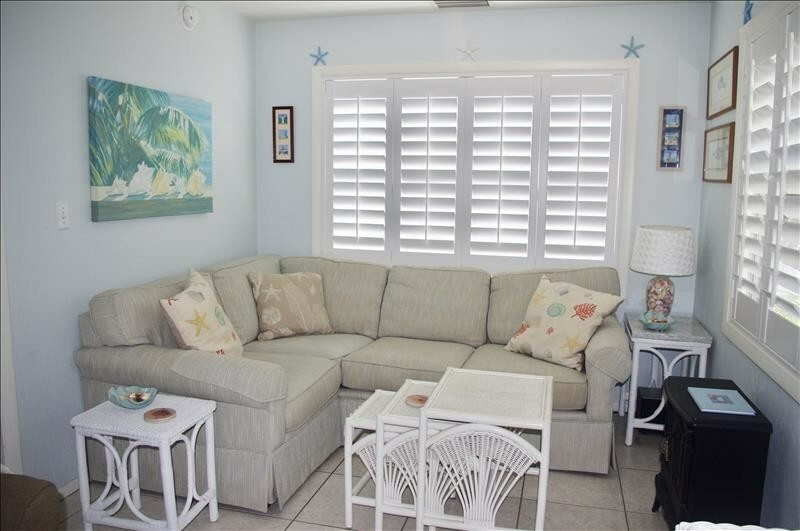 This is a great unit for one or two people and very close to the beach! Next time I return, I’ll make sure to rent this unit again. Loved everything about this cottage except not many tv channels, if that’s important to you. Beach right across road, easy access. Bed mattress is great. Very clean. Table and chairs and small grill outside under palm tree which is so nice. Felt very very comfortable and safe there. This cottage allows pets which I loved. I’m renting it again and highly recommend it. This was our first visit to Sanibel and we loved it. Our little cottage was perfect for my husband and I, and was beautifully decorated. We had everything we needed and the beach is just a short walk away. We will definitely rent here again! Every thing was great from the time we walked in – it looked like a brand new cottage. It was one of the nicest places we we have stayed. It was exactly as advertised, plus! It is only a very short walk to the beach, which was uncrowded, and we found tons of shells. We will definitely return to Duggers #4. The Cottages to Castles people were really easy to work with and they made the process really easy. Quaint, cozy, cute, convenient. What’s not to like. Great location. Close to, and easy access to, the beach. Had everything we needed. Rented bikes allowed for easy movement around the island.